Hey guys, first of all, thank you for checking out our Runescape Gold special offers. It is a great way for you to buy Runescape 3 Gold for a low price, so thanks for checking it out. Today though, we have a quick little guide on letting you know what you need in order to get the most XP and rewards from the Shadow Creatures! Only kill Manifest Shadow Creatures and get five souls and then put them in your personal slayer dungeon. Stack them up and then use AoE's to kill them all. As you can see, slaying Shadow Creatures can net you some great XP per hour and while this is not our most in depth guide. It is very easy to do and if you just make sure you do the steps we suggested and have the items and right inventory, you will have no trouble at all doing this. By the way on a side note, how cool are the Shadow Creatures? They could do so much more with these! They could add more or have them be in more parts of the game as they all do have really cool designs! 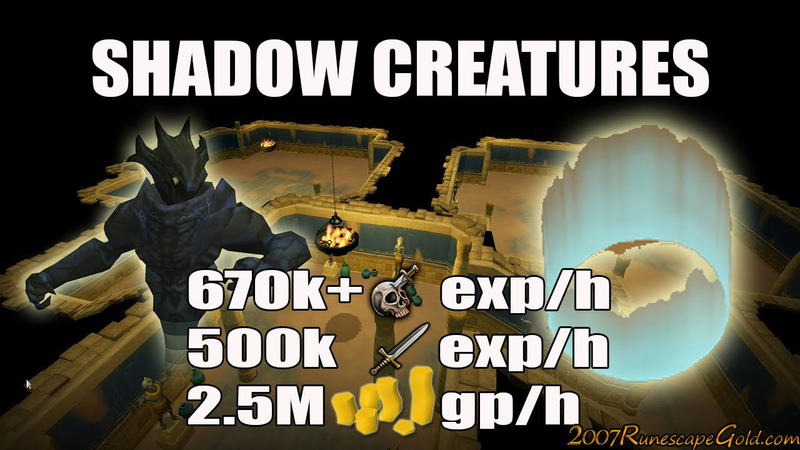 We would love to hear you guys thoughts on the Shadow Creatures and if you have used them to increase your Slayer XP in the comments below.